One Gal's Exploration of the World of Digital Technologies and Cultural Heritage. A more in-depth account of the day can be found on Dan Pett’s blog. As we had limited access this year to the internet (and various Chinese censorship laws), I created a mindmap of the geophysics session Christine Markussen and I co-chaired, as well as the roundtable Philip Verhagen and Axel Posluschny chaired the next day. Some very interesting topics arose about openness and online resources, and a new CAA special interest group for Archaeological Prospection was proposed and accepted at the AGM. An open google group/mailing list was also created, in the hopes that various threads on the topic of a method store in archaeological prospection could be collated. It was also suggested that a wiki be started which attempts to reuse as much information that exists regarding tutorials and walk throughs for survey and processing techniques in archaeological prospection. This conversation is still on going, but if it is of interest check out and join the google group ‘Methods in Archaeological Prospection’ and join in the discussion! Furthermore, this is part of a larger conversation taking place on the Open Archaeology list, regarding a general ‘Methods Store’ for all of computing in cultural heritage. There have been various suggestions about creating a community under the umbrella of the Open Knowledge Foundation, and has been particularly championed by Ant Beck. If interested in this wider discussion, check out the Open Archaeology list. As part of an effort to document the Twitter stream from the CAA UK 2011 at Birmingham, I created a Storify story here: http://storify.com/jessogden/caa-uk-2011 Check it out! I have been recently churning out some text and figures for an up-and-coming publication of last year’s Laurence Seminar at Cambridge University on “Archaeological Survey and the City”. (There’s a link to my presentation on the ‘presentations’ page, if interested) The Portus gang gave a series of talks during the seminar on everything from the range of geophysical techniques used on site and within the surrounding region, to the 3D visualization that has played a large role in the on-going interpretation of the Roman port complex. No real breaking news here, other than to have another excuse to post a recent figure I concocted for the publication which I thought was of note. 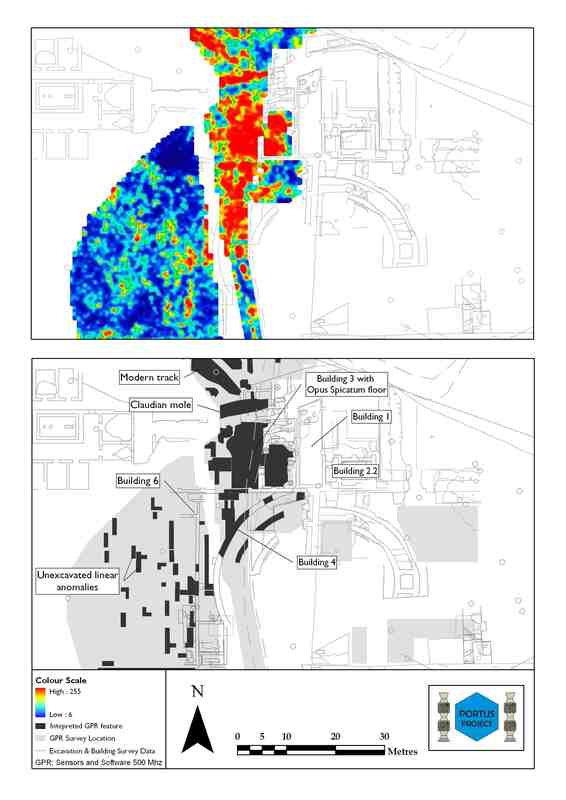 The image is an interesting one (to some of us..) as it displays some of the GPR (500 MHz Sensors and Software) data from 2007 alongside the ongoing interpretation and excavation data from the 2006-2009 seasons. A great deal of the ground from this survey area was excavated in the last season, further shedding some light on the GPR data. The large area to the West of Building 1 (part of a cistern complex) turned out to be a the floor (in the style of opus spicatum) of a room (whose function is still under debate) which connected the cisterns on either side of the trackway. Bits of the walls of the so-called amphitheater were also revealed in the GPR data very early on, including what seemed to be 3 concentric walls under the modern trackway. It was confirmed through excavation in the 2009 season that the amphitheater indeed had a third (previously unknown) outer wall, connecting it to the adjoining room block. The Claudian mole which runs along the northern edge of the excavation was also seen to continue underneath the modern trackway as noted in the large east-west, high amplitude feature. The modern trackway (containing a series of gravel deposits extending up to circa 1 meter below ground) which bisects the Imperial Palace at Portus resulted in (multiple) very high amplitude reflections throughout the slices in this area, making some interpretations of other anomalies somewhat tricky. Some of the north-south and east-west walls in Area E (excavation area to the West of the track) did not show up so clearly in the GPR data. The traverses of this survey were conducted in an east-west direction, perpendicular to some of the walls in question. I’m convinced the issue lies with the survey line resolution (0.5m spacing with walls less than 0.5m wide) combined with the survey direction, probably leading to patchy results in this area. Uploaded my MSc Dissertation- Finally! I recently uploaded my unpolished MSc Dissertation on geophysical data fusion to Scribd today. Just thought I’d add a post, and embed it here for good measure. It’s been over 2 years since I wrote this, and though I’ve moved on a bit since and probably wouldn’t necessarily agree with everything in it, thought I should probably put my money where my mouth is when it comes to open access. OH, and I should admit (as this has been pointed out to me several times) that though I used various color ranges for the geophysics results, I do realize now that this may not be best practice! As I’ve spent the last hour rummaging through the maze that is the various GPR-Slice projects that I created over the summer, it is becoming more and more clear that I (need I say, we) need a more effective means for storing meta data about geophysics projects. Luckily, I took lots of notes during the whiz-bang pilot GPR season in June- but even so, it’s now December and I am in desperate need of generating some slick images for a poster session coming up next week. Sadly, I still need to reprocess the data (to include topography, and hopefully correct for the mosaic issues) and though the little trail of bread crumbs I left myself is helpful, it would be even more helpful to know the EXACT processes that worked and didn’t work along with any suggestions for improving them. I guess I’m really in search way to create a map, or flow chart of some sort. We can get to how we attach actual meta data to the results later. At the end of the day, all this talk about a ‘method store‘ for archaeological prospection has really got me wishing I had already implemented my own personal one to keep my data and methods straight! My new (ongoing) goal is to document the next go-round with this Catal data set, namely this weekend- hopefully producing a more decipherable set of steps, (as opposed to the bread crumbs) for when I or anyone else would like to know how we produce the results. But this is all pie in the sky, right? 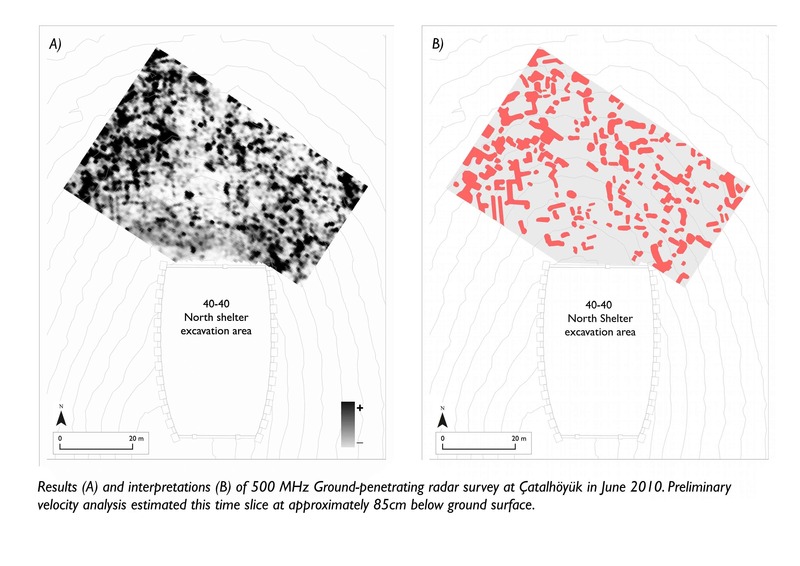 First crude stab at interpreting one timeslice of the 500 MHz GPR data collected last June at Çatalhöyük. I had to prepare a couple of images this last weekend for an abstract for the London Geological Society Meeting in December and in the process came up with the first stab at digitizing some interpretations to one of the many timeslices from the 500 MHz GPR data collected last June. (More information on the survey can be found in a previous post) Initially I wasn’t very keen on attempting interpreting the slice as we still have not corrected the data for topography or tilt yet, but in the end I think it was a good exercise for me in coming to terms with actually making interpretations on the data- versus simply digitizing every reflection on the timeslice. I think there’s certainly some promising anomalies/features appearing in this particular slice (thus far estimated at 85cm below ground surface, but still a contentious estimate). In addition to topographic correction and velocity analysis, there still needs to be quite a bit of mosaic correction done as well. As the survey was completed over the course of an afternoon and the following morning the relative amplitude ranges as well as the time zero points vary significantly between the two days. For the initial timeslices I ended up correcting the relative amplitudes through various attempts at adjusting the gain curves on each trace, automating and clipping each radargram to their respective time zero point, and then crudely adjusting the resulting amplitude ranges in the pixel based timeslices themselves. I think with greater refinement to the relative gain curves I can probably avoid the pixel based mosaic corrections, but have yet to have the time (and access to the software) to have a real play with the data. Soon enough though- as the goal is now to make some real progress in preparation for the poster in December. Here’s hoping!